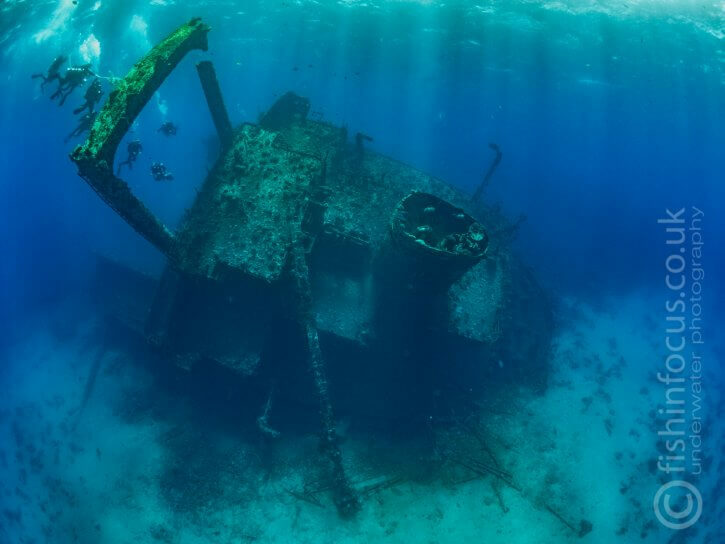 When talking about Red Sea wrecks, there is an image that comes to mind, the iconic stern section of the Giannis D.
Today I will talk about what in my opinion is the best way to dive this wreck from a photographic point of view and offer some tips on how to get the best possible shot. Laying on the westernmost corner of Sha’ab Abu Nuhas it is the most recent of the four wrecks on the reef. After sinking it came to rest leaning on the port side at about 45 degrees next to the reef at a depth of about 26 meters. 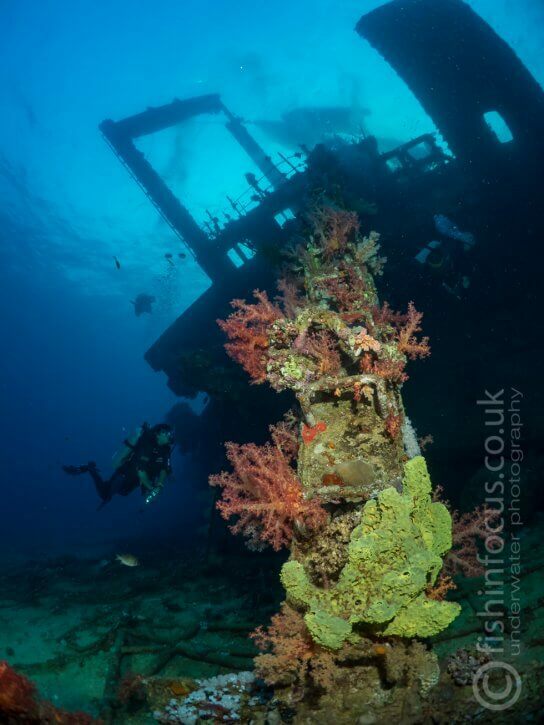 Most guides prefer to visit the Giannis D as the first dive of the day however at that time the sun will be too low and the reef will cast a shadow over the whole wreck. On the photography trips I run, such as the Winter Warmer, we plan the dives when the sun is high in the sky and the light on the wreck better. This is normally the second dive of the day. The light on the wreck is best on the second dive when the sun is high in the sky. Diving the wreck involves a short rib ride and start next to the distinctive A-frame in front of the ship’s bridge. From here, I always recommend swimming in mid-water around where you can take the classic image of the stern. Try to shoot from different angles, closer to the reef you will get the ship straight from the back but if you swim away it is possible to get the whole stern section which in my opinion is a much more engaging shot. For this wide shots, make sure you use the widest possible lens you have and if possible use a fisheye. Remember the wider the lens is, the closer you can be to the wreck increasing the image sharpness and contrast. Remember that your strobes will be pretty useless in this case so use manual white balance and shoot using ambient light. Another option to help you with to get better colours is to use correcting filters. but remember they will cut some available light so you will have to increase your ISO. 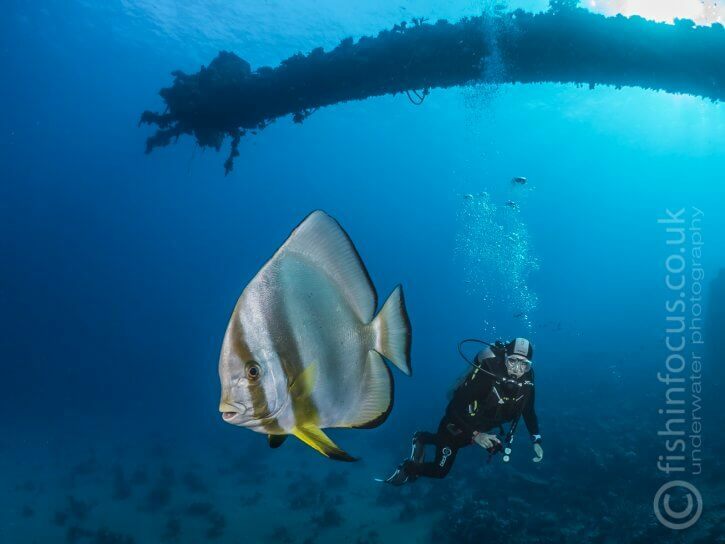 Once you have bagged your “Stern shot” you can move closer to the wreck and probably venture a bit deeper close to the sand, where there is the chance to take a great shot of one of the metal beams covered in soft corals and sponges with the bridge and funnel in the background. Use your strobes to light the corals and a fast shooter speed to control the light in the background. Around this part of the wreck, you will find a number of cables and railings covered in corals making for great subjects, keep an eye for colourful nudibranchs, stingrays and often friendly batfish. 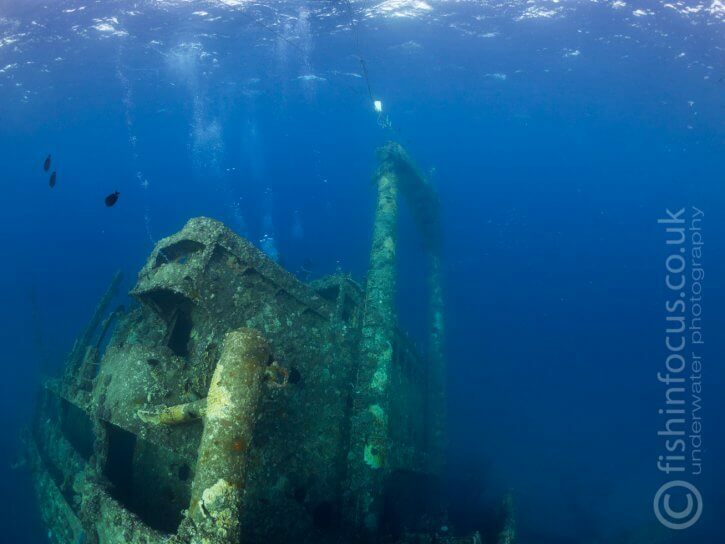 Is now time to venture inside the wreck. Because the position of the ship, going inside can be a bit disorientating and can make you feel a bit odd, so it is worth following your guide or stay outside if you do not feel anxious. Entering the wreck the back, follow a corridor and turn right on the second door you see, this will lead you to the Engine room. You can drop down to see the big engine head and in the deeper section towards the left (port side), you can see the workshop. Focusing here can be challenging because of the lack of light. A torch or video light can be helpful in this situations. When using a fisheye lens you can pre-focus at about 1 meter from the camera and by using a small aperture you can almost guaranty everything will be in focus. 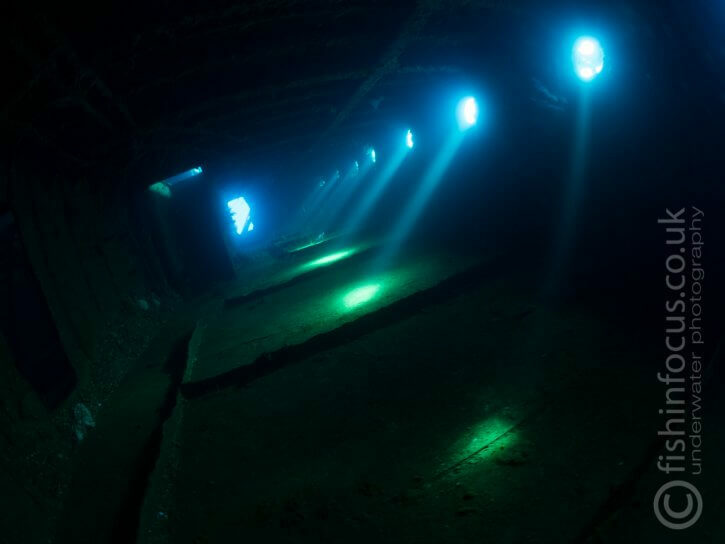 Inside the engine room, silt can be a serious problem so pay attention to your strobes positions to prevent problems with backscatter. Opposite the door you use to enter the engine room there is another door leading to an empty room which should have been a communal area for the crew. The light coming through the portholes makes for an atmospheric and evocative shot. From here I normally head straight towards the bow pretty much ignoring all the collapsed middle section. However, this area can be good to find crocodile fish as well as a lovely anemone with its clownfish. The Giannis D bow lies on its side and the main attraction is the mast. Sticking out parallel to the seabed in about 15 meters, the mast is covered with soft corals and home to a huge number of anthias and other reef fish. Is not unusual to see a small school of batfish swimming around, they tend to be curious and if you move slowly you will be able to take some great shots of these cute fish. Remember to control your strobe power and position, the silvery side of batfish is incredibly reflective and will easily blow up. 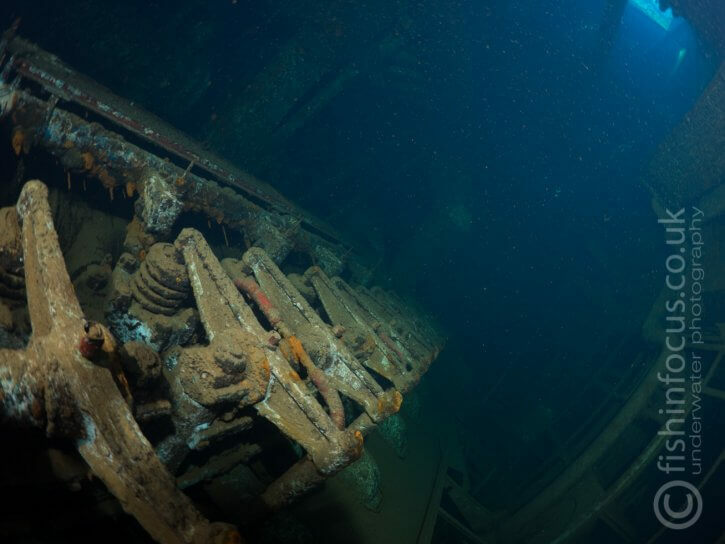 On your way back, when you approach the stern section, have a look at the structure from this angle you can get a dramatic view of the wreck which is not normally photographed. 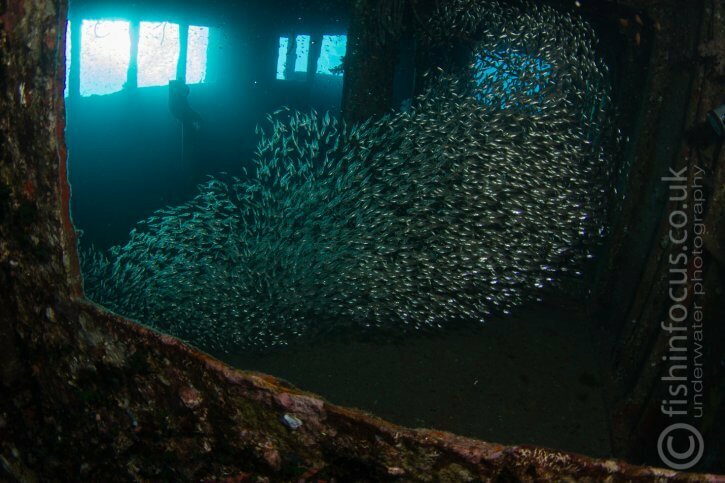 At this point, is worth visiting the bridge which is home to a big school of glassfish and to the funnel itself, another iconic area of the wreck. 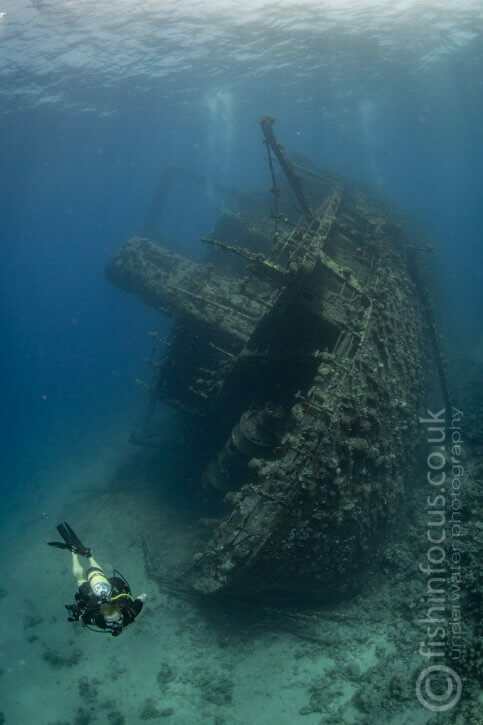 As many other wrecks, the Giannis D as a lot of macro subjects on offer, enough to keep you busy for a whole dive. Nudibranchs are very common and looking closely at all the railings there is plenty of little critters and fish in them, I’m particularly attracted to the small blennies that live on the stern railings. In some rare occasions when the wind blows from the south or the conditions are incredibly calm your captain and guides may offer a night dive. This is a great opportunity to shoot some strange creatures such as the flashlight fish and a range of crabs and shrimp. 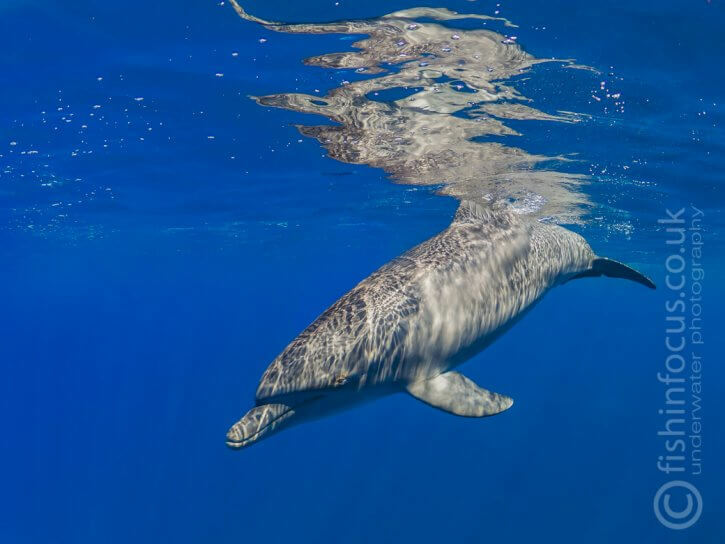 Sha’ab Abu Nuhas is regularly visited by a pod of dolphins and it is not uncommon for them to show up during your dive so keep an ear open for the squicking noise they make which often precedes their appearance. Set up your ISO to auto and select a fast shooter speed to ensure you can freeze the movement when they show up. Dolphin often cruises Abu Nuhas Reef. Other occasional visitors to the wreck are hawksbill turtles. They feed on corals and sometimes can be seen resting tucked in between the debris. If you see them, use a slow approach and always leave a clear space for the animal to swim away, that way it won’t feel trapped and chances are it will stay in the same place. You can use the safety stop to take some shots of your dive buddy on the ascent line but be aware of the surge which can be strong. Join Mario on one of the “Winter Warmers “ photo trips to have the chance to dive carefully selected dive sites in the Northern Red Sea and take your underwater photography skills to the next level.